Reliable – Conveyor reliability begins with the drive unit. 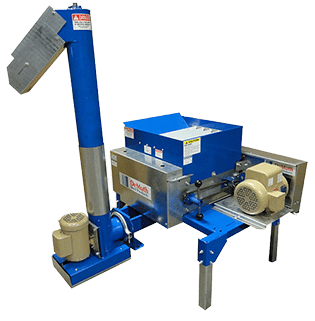 The Valmetal conveyors feature an industrial gear box drive system designed to last longer with less maintenance, so you can count on more years of trouble free operation. The large diameter lagged drive pulley offers slip-proof traction. Flexibility – Reversible, to convey in either direction. Choice of belt textures and widths 14″, 18″ or 24″ to match your feeding needs. Standard belt conveys level and up moderate inclines (up to 10¡) and textured belt allows conveying up steeper incline (up to 30¡ elevation). DeMuth manufacturers premium quality conveyors and feeders for farm and industrial use. Our solid construction and practical design means you can expect years of dependable service from our products. DeMuth Roller Mills are designed and manufactured from the inside out to provide years of reliable, consistent operation. The rolls are CNC machine cut from alloy steel, then hardened by heat treating to 53-60 Rockwell C. This process ensures an accurate and consistent depth of teeth, along with extremely precise pitch spacing. Rolls are balanced to reduce vibration and to prevent premature wear of bearings and roller shaft components. Chrome silicone alloy steel springs keep the rolls at the same compression throughout the adjustment range, providing for uniform roll pressure regardless of roll clearance. Springloaded rolls help reduce damage to the rolls when foreign materials pass through. All together, the carefully chosen materials and meticulous manufacturing processes ensure rolls with harder teeth and greater wear resistance… better value for your machine dollar. Designed for ease of use, adjustment, and maintenance, the DeMuth Roller Mills feature a single, “no tools” adjustment point to vary the degree of grain reduction. A simple snap pin maintains the proper adjustment. Power requirements are reduced because non synchronous roll speeds shred or grind the grain instead of compressing it. The heavy duty chain drive, self-aligning bearings (sealed for life), and large-diameter fatigue-proof shafts–all critical components–contribute to the durability and quality of the DeMuth Roller Mills. Alloy steel, CNC-machined Rolls with Hardened Teeth for unsurpassed wear resistance and outstanding reliability. Four different capacities and four different roll cuts provide maximum flexibility. Operator-friendly…single point adjustment to vary degree of grain reduction, plus quick and easy roll changes. UNSURPASSED FOR FREE-FLOWING AND SEMI-FREE FLOWING. 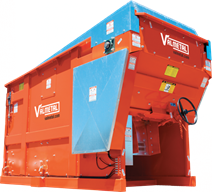 With a Valmetal Grain-O-Matic Unloader, you get more “positive” delivery, day After day. Overload protection for the sweep auger. A unique ratchet mechanism drives the drive shaft. It is engineered with a spring loaded ratchet pawl which idles should the sweet auger meet an impasse. The exit auger closing is easy to operate and requires only minimum opening clearance. This provides more room beneath the unloader for conveyors and auxiliary equipment. Powered by a 3 H.P. motor, the GRAIN-O-MATIC comes with different sized drive pulley sets so you can change auger unloading speed by simply flipping the drive belt. GRAIN-O-MATIC CK CONVERSION KIT – Fed up by high maintenance costs and slow feed delivery? Maybe you should consider a GRAIN-O-MATIC CK. Specially designed to be installed in sealed steel bottom unloading silos. Easy installation without silo modification provides the same features than the standard GRAIN-O-MATIC. The mill comes with 2 screens, but 5 screens are available to process grain to desired size: 1/8, 3/16, 1/4, 5/16, 3/8 and 1/2. Model with Proportioners and Discharge Auger capable of processing up to 7 ingredients in a continuous operation.